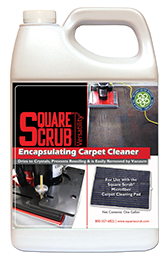 Designed for use with the Square Scrub EBG-20/C and the Square Scrub Microfiber Carpet Cleaning Pad, Square Scrub Encapsulating Carpet Cleaner captures soil and dries to a non-sticky crystal that can be vacuumed up and disposed of easily. Only 8oz. required per gallon. A significant savings over other encapsulation cleaners. This product is Carpet and Rug Institute certified.